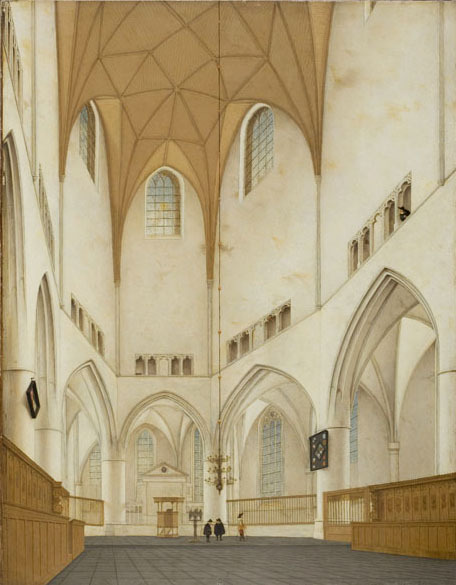 Saenredam spent most of his life in Haarlem, where he painted this interior view of the town's main church (which would become his burial site). The structure, originally built by Catholics, was converted to a Dutch Reformed Church in the late sixteenth century, when Protestantism became the dominant religion in the northern Netherlands. The simplicity of the church interior was dictated by Protestant emphasis on the word rather than visual adornment. Saint Bavo's today remains much as it was depicted by Saenredam, the first Dutch artist to specialize in faithful renderings of specific buildings. His method of working was careful and accurate. He would first make a detailed sketch on the site, followed by an even more precise construction drawing, often with the help of measurements and plans. The initial sketch for the Worcester painting is preserved in Weimar, Germany.